Instead of a traditional, stuffy wedding that nearly everyone dreads, we wanted to have a fun celebration that our guests would remember for years to come. Also, did you know the average cost of a wedding in this part of the US was $37,646.21 in 2003? That's ridiculous! Our goal was to produce a high-quality wedding and reception at a fraction of that cost. 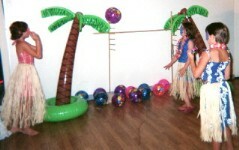 I can't recall exactly how we came up with the idea of a luau, but once the theme was set, the ideas flowed freely. The first and most important detail had to be worked out before all others: where to hold such an occasion. The best place for this beach-themed event would have been an outdoor venue, but fearful of unpredictable weather here in Ohio, we opted for an indoor reception hall. Boy was that a good choice - it stormed all night during the wedding and reception. Since both of us are spiritual, but not belonging to a specific church, we didn't feel the need to have a church wedding. The ceremony itself would take place on the dance floor, in the center of the reception hall, where everyone could easily look on from their tables. Once we found out reception hall, we were excited to get started picking the decorations and favors that would make this event to fun. Oriental Trading Company offered almost everything we needed, from leis to a limbo game , at affordable prices. Bit by bit, we ordered all we'd need from them, including plates , cutlery , and other tableware. eBay proved to be a great place to find the odd items, like a conch horn to be blown to get the crowd's attention. From the beginning, we knew we wanted to make our own food, versus hiring a caterer. We tried out many recipes, eliminated some, combined others, and came up with a great menu. We made most of the food ourselves, but relatives offered to prepare some of it. We selected the easier recipes, purchased all the ingredients, and passed out everything they'd need to prepare the dishes. The help was invaluable! Though we were doing most of the work ourselves on the wedding, we knew we had to hire a D.J. That was easy, but picking the music was a chore in itself. We selected our favorite songs from a song list book we received in the mail from a prospective D.J., then calculated approximately how many songs would actually be able to be played, and narrowed down our favorites to what would actually be played. For the music to be played as our guests arrived, we chose an instrumental C.D., 2 Pan Paradise by Greg MacDonald . Also on that C.D. was Hawaiian Wedding Song , which we decided to use for our processional. Orinoco Flow by Enya was our choice for the Recessional. For while people were eating, we chose some themed songs, including a lot of The Beach Boys and Jimmy Buffett . From the time the cake was cut 'till the end, the music was a mix of oldies, country, disco, 80's, and a few recent top 100 songs. Being crafty and somewhat creative, I wanted to design all the invitations, RSVP cards, and programs myself. Not only did I do that, but we printed, cut, and folded everything, too. Everything turned out beautifully and was able to be customized for each and every guest, hopefully giving them a sense that we wanted this to be special for them, too. Instead of an expensive photographer, we opted for the disposable wedding camera route. To save a few extra bucks, we purchased generic single use cameras, printed instructions on sticker paper, and pressed the directions on the backs of each camera. Voila! Instant wedding cameras for each table. Out of those 360 pictures, plus additional pictures taken by family, I think we'll have a great selection of photos to choose from and reprint as necessary. Ladies, don't think I forgot the most exciting part for many brides - the dress, flowers, and jewelry. The clothing and flowers were ordered from the Internet and shipped to us directly from Hawaii. It was easy to find matching tropical print wedding outfits, as many sites out there feature such categories on their storefronts. Same for the flowers; most tropical flower sites I visited offered a separate section of wedding flowers. You'd be surprised at the low price such items are available for; even with shipping, we couldn't have found these items cheaper locally. As for the jewelry, it was all handmade by me. With some extra time to play, we created a few special touches with homemade items. We made a bamboo card hut to collect gifts, a bamboo picture frame with a matching mat for our guests to sign in lieu of a guestbook, handmade the wedding jewelry, and decorated the cake serving set to match the theme. in any amount, from 50¢ to $50, it would help keep this site up and running for others. unless for personal use. Copyright © 2003-2011 All Mixed Up, Ltd. All Rights Reserved.